Obstructive Sleep Apnea: This is the most prevalent form of sleep apnea, and it is caused by obstruction of a person’s airways. People who experience this type of sleep apnea usually aren’t aware of it at all, and end up learning of it due to the concern of someone who has heard them sleeping or becoming concerned with persistent tiredness throughout the day. The throat is made up of walls of soft tissue, and because the body (and muscles) relax during sleep, the throat can become obstructed by those soft tissues. Up to 6% of adults will suffer from this at some point in their lives. Central Sleep Apnea: Central Sleep Apnea only affects less than 1% of people. Obstructive Sleep Apnea is an otorhinolaryngological problem whereas Central Sleep Apnea is a neurological problem. It’s caused by a lack of stability in a person’s feedback mechanisms. Respiratory control centers in the brain are imbalanced which leads to the brain failing to give the signal to inhale. So, people end up missing one (or several) cycles of breathing. After this, the body can try to overcompensate with a period of faster or harsher breathing to get more oxygen into the bloodstream. Mixed Sleep Apnea: This is also sometimes called Complex Sleep Apnea, and it is characterized by having both types of sleep apnea at the same time. Sometimes, when someone is treated for Obstructive Sleep Apnea successfully, Central Sleep Apnea will begin to occur; sometimes, both can occur simultaneously from the beginning. As the secondary title suggests, this is a complicated syndrome that requires an in-depth sleep study and sometimes multiple methods of treatment. Sleep apnea can be mild to severe based on how many apnea events a patient demonstrates per hour. An apnea event is a period of ten seconds or more where there is a pause in breathing during sleep. Hypopneas are another breathing abnormality that occurs during sleep, and these are periods of abnormally slow or shallow breathing. The severity of your sleep apnea diagnosis is dependent on the amount of those occurrences that someone experiences per hour. That is measured with the Apnea-Hypopnea Index or AHI. Here is a deeper look into that. However, children’s bodies are different and an AHI value greater than one is considered abnormal. Regardless of how sleep apnea is categorized, it can be treated and even cured in some cases. There are multiple avenues of treatment for sleep apnea depending on what type you’re dealing with, what your doctor thinks, what you think, and so on. Here are some of the best and most widely used methods of treatment and what they entail. CPAP stands for Continuous Positive Airway Pressure, and BiPAP stands for Bilevel Positive Airway Pressure. 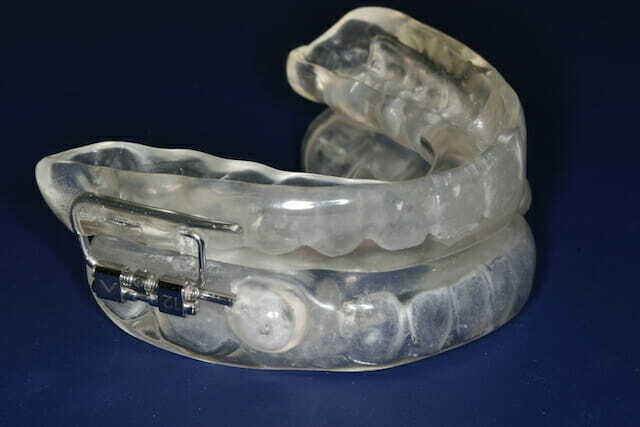 They are both similar in function and are the top non-invasive treatment avenues for sleep apnea. CPAP machines are the number one solution used nationwide and are usually the first thing that you will try on your path to better sleep. These machines are most typically used for obstructive sleep apnea. A CPAP machine is a small box that sits next to your bed that contains a fan that pulls air in and pressurizes it before sending it through a tube into a mask that you would wear. Doctors prescribe the air pressure setting on the machine after observing the results of a sleep study. A filter in the machine aids in the elimination of dust, smoke, and other impurities; a humidification chamber makes the air warmer and moister so that it doesn’t dry out or irritate your airways. With OSA, the soft tissue in the throat and oral cavity can relax and block airflow leading to pauses in breathing. The CPAP delivers a stream of pressurized air to keep airways firm and open so that the user can breathe freely. BiPAP machines, sometimes also called BPAP function very similarly. When a patient needs a relatively high-pressure setting, suffers from lower than average oxygen levels, or just didn’t respond well to the CPAP, that is when this machine is useful. A common setback of the CPAP machine for many patients is that they struggle to adjust to the constant stream of pressure and may not be able to exhale properly. The BiPAP solves this by having two different prescribed pressures: a higher pressure for inhaling, and then a lower pressure for exhaling. A study published by the National Institutes of Health showed that half of the people suffering from OSA generally only experience symptoms when they are sleeping on their backs. This subtype is called Positional Obstructive Sleep Apnea. The Night Shift Sleep Positioner uses vibrotactile positional therapy to help prevent you from sleeping on your back while you’re wearing it. What this means is that patients wear Night Shift on the back of their neck and when it senses that they’ve turned onto their back, it will slowly increasingly vibrate until the position is changed. The CPAP machine was the primarily preferred method of treating Positional OSA until mid-2017, but Night Shift and positional therapy are clinically proven solutions. Some patients just can’t use a machine, and many of them refuse because adjusting to it proves to be too difficult for them. When that happens, Night Shift is the next step. 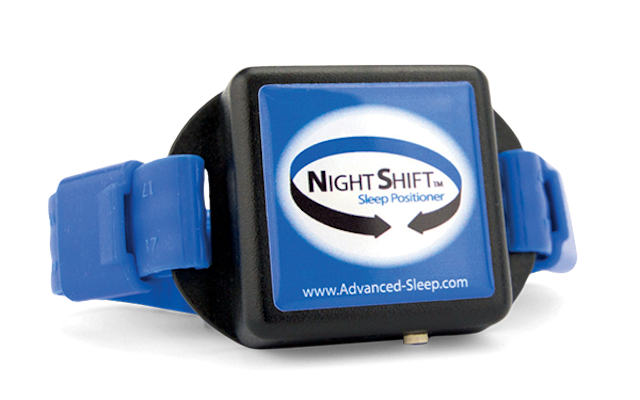 Another way that Night Shift is beneficial is that it monitors sleep quality, snoring, and more. This provides in-depth and important information to physicians and patients alike. Advanced Brain Monitoring reports that 90% of patients responded to the therapy and that most of them showed reduced sleep fragmentation, hypoxemia, sleepiness during the day, and symptoms of depression. On top of that, they also slept more deeply and snored at a lower volume. There are some breathing exercises that can be useful in lessening the severity of sleep apnea symptoms, and in some cases, treating mild cases entirely. This isn’t something that you should do in lieu of other methods, but it is something you can do along with them to increase the efficacy of your treatment. 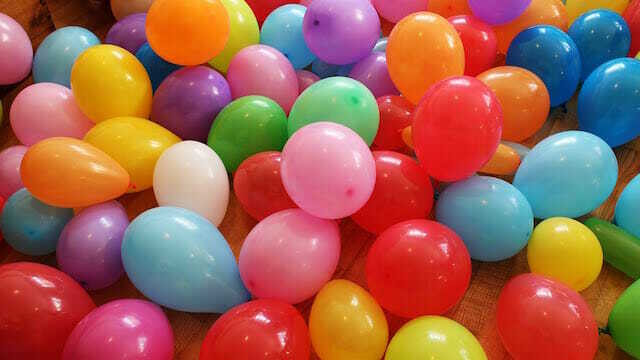 Breathing in through your nose and then slowly blowing up a balloon can help you get used to breathing through your nose and strengthen muscles. Slowly and steadily inhale through your nose, and exhale fully into the balloon, and then breathe in as you release the air in the balloon. Another exercise called the tongue hold can help simulate your breathing at night and train your body how to breathe with that minor obstruction. Press the length of your tongue to the roof of your mouth and leave it there as you steadily breathe in and out through your nose. When the information was first publicized in the American Journal of Respiratory and Critical Care Medicine by Dr. Lorenzi-Filho of the University of Sao Paulo Medical School, he said that there was a 39% decrease in the severity of symptoms among the patients he studied (but it was only 31). Another physician, Dr. Catriona Steele of the University of Toronto pointed out that the findings were plausible, but that it would need to be explored more in-depth to confirm anything. Breathing exercises should not be used in place of seeking medical help with sleep apnea, and you should stop if you feel lightheaded, but there is research out there that shows it can make a difference. Provent Sleep Apnea Therapy is another option for OSA, and clinical studies show that Provent led to significant improvements across varying levels of severity. It is a nasal device that is placed just inside the nostrils and held on with adhesive. The proprietary MicroValve design creates pressure when you exhale to keep your airway open. The valve opens and closes, which redirects air through small holes to create resistance. This resistance on exhalation is called EPAP, and it maintains enough pressure to keep your airways open until you inhale again. It’s very discreet and convenient, and because it uses your own pattern of breathing, it can be more comfortable than other methods of treatment. In America, this option is available by prescription only. Dr. Michael Breus, known also as The Sleep Doctor, has said that Provent “has been nothing short of amazing. 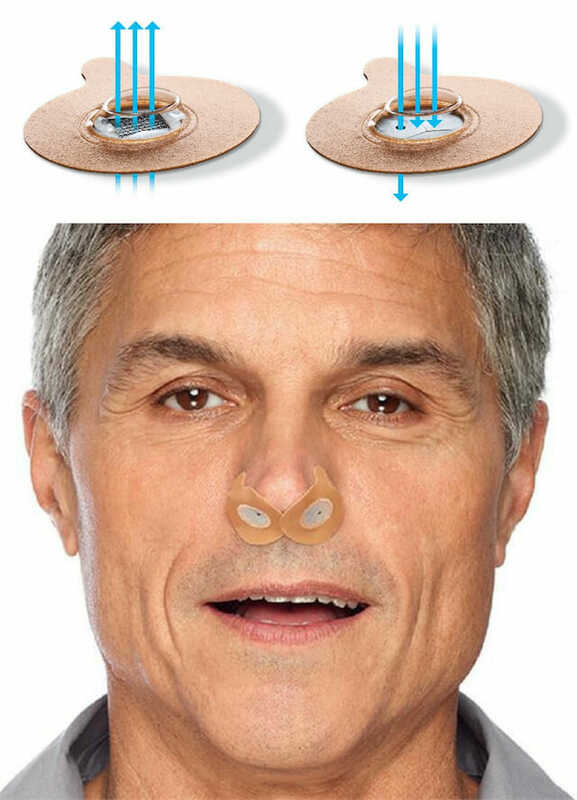 Provent is a small band-aid type of valve that is placed on the outside of the nose. While it lets 100% of the air in, it closes a little bit when a person exhales and causes a negative pressure system to open up the airway without a dental device or a CPAP.” Smaller devices like this have a lot of advantages. If Provent is right for you, you wouldn’t need to sleep with a mask, dental device, or positional therapy device; those are all great methods, however, they can be uncomfortable or too loud for many patients. The Pillar Procedure is actually a minor surgical procedure, and it is one of the technically more invasive on this list. However, it is extremely simple, safe, and highly effective. This outpatient procedure just requires a local anesthetic and less than 30 minutes of your time. This procedure is made for people with OSA or a snoring problem. 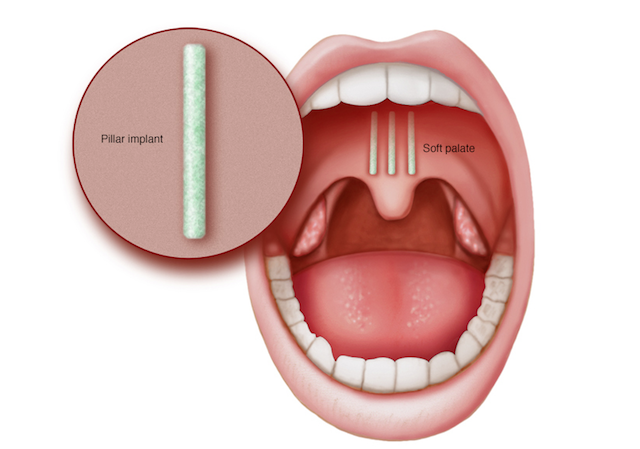 Struggling with this is usually caused by a soft palate, and the pillar procedure stiffens the palate with small woven implants that are designed to provide structure to it. Studies have shown that 80% of patients saw a decreased intensity of snoring, and 80% of patients saw a reduction in their apnea-hypopnea index for over a year after the procedure. Across the board, patients reported less sleepiness throughout the day, lifestyle improvements, and bed partner satisfaction. Pillar is designed to have a lasting effect. Because it is a long-term solution, some patients may not see improvements until three months after their procedure, but others have reported noticeable improvement within just a few weeks. This procedure is also advertised as causing less discomfort than other options because no tissue has to be removed, and no lasers, chemicals, or radio-frequency is used in the process. Other similar options may also entail multiple visits or an operating room procedure, but Pillar is designed to allow patients to resume normal activities that same day, to allow them fewer visits, and to be very simple and clear-cut. The US Patent Office lists more than 300 devices designed to stop snoring, but Pillar is one of few that have been proven to be effective. Currently, almost 50,000 people around the globe have been treated this way. Oral Appliance Therapy is a treatment method in which a person wears what is essentially a mouth guard or retainer while they are sleeping, which is known as an oral appliance. How this method works is by supporting the jaw in a forward position which keeps your upper airways open. This is a treatment used for OSA. The device is custom fit to a patient’s mouth and will require a few trips to the dentist so that impressions can be taken and the device can be molded to fit your mouth perfectly. Some of the highlights of pursuing this avenue of sleep apnea treatment are that it’s quiet, portable, easy to maintain, and is custom-fitted so that it is as comfortable as possible. Treating OSA will improve your quality of life dramatically as long as you remain consistent. You will be able to sleep better, have more energy, a healthier cardiovascular system, and more. Oral Appliance Therapy is another possibility for people who struggle with machine treatment, but it may not be best for everyone. It may cause discomfort from keeping the jaw forward until the wearer gets used to it, or lead to dry mouth. Ultimately, your sleep is something that you have a right to, and with that comes the responsibility of taking care of it as best that you can. Patients who didn’t do well with CPAP machines and are not interested in using surgery as a possible treatment are both potentially eligible for this option. The National Sleep Foundation says that weight is an important factor in obstructive sleep apnea. In congruence with that, Harvard Health Publishing on the Harvard Health Blog says that apart from breathing devices, weight loss is one of the best possible treatments for sleep apnea. 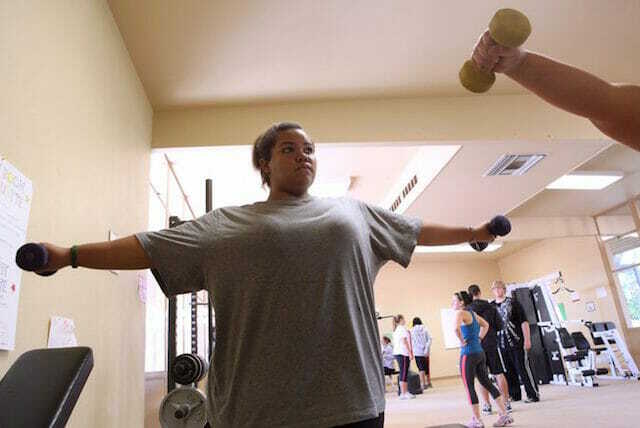 It is not true that everyone with OSA will struggle with their weight nor is it true that everyone who is obese will have OSA, but there is a strong correlation between the two. People who are overweight for their age and body type have extra tissue in the back of the throat. This extra tissue can fall down over the airway as the body relaxes during sleep and in turn, it will block the flow of air into the lungs. “Losing just 10% Losing just 10% of body weight can have a big effect on sleep apnea symptoms. In some cases, losing a significant amount of weight can even cure the condition,” is what Dr. Epstein had to say. Dr. Epstein is the John H. Foster Professor and Chair of the Department of Health Policy and Management at Harvard Chan School of Public Health, and he has collected a number of impressive accolades throughout his career-long commitment to improving access to and the quality of healthcare. Losing weight is a personal choice and a very personalized process for everyone, and committing to losing weight is great if that is the best choice for you; however, losing weight should not be used in place of other treatments that a doctor suggests in the meantime as you go through your weight loss journey. Losing weight can lessen the severity of sleep apnea, or treat it entirely, depending on what is the root cause of a patient’s OSA if they have Complex Sleep Apnea, and several other factors. Some patients will see improvement but still require additional treatment with another method in the end. The American Thoracic Society found that after losing weight, 75% of 72 patients studied did not continue to suffer from sleep apnea after losing weight. All of those patients maintained those results for a one-year follow-up. Patients with severe sleep apnea that required additional treatment still saw a reduction of about 25 events per hour. Not literally, but it will help you exercise your throat. Throat exercises do not have the same research behind them and they’re not well-established as a solution to sleep apnea, but some studies show that they do improve the symptoms in some lesser cases. Obstructive Sleep Apnea is caused by weak or soft tissue collapsing during sleep and blocking a person’s airway, and the theory with throat exercises is that if the muscles are strengthened, the tissue is less likely to collapse. The American Journal of Respiratory and Critical Care Medicine first studied this approach in 2009. Half of the participants did breathing exercises, and the other half did throat exercises. Some examples of these exercises are singing, swallowing, chewing, placing the tip of the tongue against the front of the palate and sliding it back, and repeating vowels. Three months later, the group who completed the throat exercises had improved by 39%. One medical journal features a study called “Didgeridoo playing as alternative treatment for obstructive sleep apnoea syndrome”. The muscles that keep your airway open may be too weak, and strengthening them can help to reduce some symptoms. Depending on the severity of your sleep apnea, this could eradicate it completely. There are different exercises based on what part of your mouth is collapsing to cause the obstruction. If it is your tongue that causes the most problems, you should focus on strengthening your tongue with exercises like tongue slides, soft palate blowing, and soft palate stretching. If your throat collapses, the tiger yell is the most suggested exercise, but as has been proven already, playing some instruments can help with that as well. Singing is a great and fun option, it can improve both the throat and soft palate, two common problem areas that will get weaker with age. While this may be an effective solution for many people and it does have scientific backing, it is important to remember that sleep apnea can lead to serious problems if it is not adequately overseen by a medical professional. Upper Airway Stimulation is the newest sleep apnea solution featured here as it was only FDA approved in 2014. Despite that fact, major scientific journals are already presenting very promising data. The New England Journal of Medicine reports that two-thirds of patients saw drastic improvements, 85% stopped snoring entirely. Upper Airway Stimulation is achieved with a neurostimulation device implant. It is made up of a breathing sensor and the stimulator. 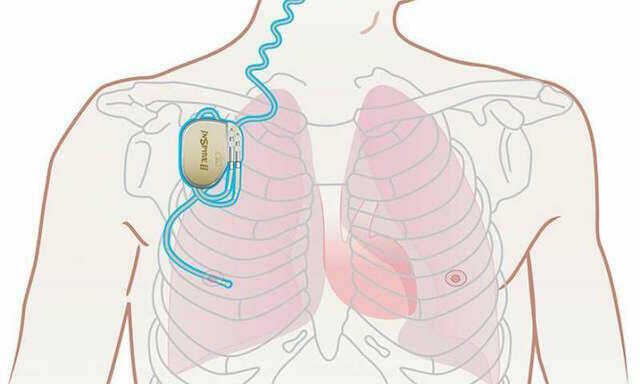 The breathing sensor detects patterns in a patient’s breathing and signals the stimulator to trigger the hypoglossal nerve to prevent an apnea event. The hypoglossal nerve engages the neck muscles and opens the breathing tube. This addresses apneas automatically, causing them to stop altogether. Treatment compliance with other methods like the CPAP machine, oral appliances, and even positional therapy can become slack after a while. It is difficult for a patient to have a concept of how serious a medical problem is if it is happening while they are asleep. This implant paves the way for patients who struggle with compliance to see restful sleep again. This technology was developed by Dr. Kezirian. Dr. Kezirian has dedicated himself to extensive research and clinical practice in treating sleep apnea for the duration of his career. He’s been working particularly with this approach for more than a decade. He is a world-leader in sleep apnea surgery and is an expert in the procedure required to determine a patient’s candidacy. There are rigid guidelines that are used in determining if this option may work for someone better than a less extensive solution. At this time, candidates for the Inspire implant have dealt with moderate to severe sleep apnea for some time; the ideal patient experiences between 20 and 65 events per hour. Also, patients must have been unsuccessfully treated with CPAP, and require a drug-induced sleep endoscopy to look at their anatomy. A lateral wall collapse with an anteroposterior collapse of the soft palate may rule someone out. The ideal patient would have a concentric collapse of the soft palate. Anatomical factors, BMI, and AHI must be thoroughly explored to ensure that this is the best possible treatment for a person. For those who have been treated with it, Dr. Kezirian and his team report consistent results even five years after the initial procedure. Somnoplasty is the shorter term for a process called Radiofrequency Tissue Reduction, and it is primarily used for treating OSA. While the term sounds a little bit intimidating, this is a very simple outpatient procedure that only requires a local anesthetic and can take less than an hour. The somnoplasty system uses a slender electrode to create small abrasions near the back of the tongue and in the tonsil area. The purpose of the lesions created is to tighten the tissue in the area and reduce it, creating more space at the back of the throat. This allows for easier breathing during sleep because there is a larger space through which air can pass through. The most recent information says that there are upwards of 22 million Americans struggling with sleep apnea, but the “gold standard” treatment with a CPAP machine turns out to be the wrong approach for many of them. Close to 40% of users can’t tolerate the CPAP machine. Procedures like somnoplasty exist so that people who do not react well to other treatment avenues still have options. While it is minimally invasive, this is still a significant medical procedure; it is recommended that patients explore other options before pursuing somnoplasty. The system was first FDA approved for sleep apnea 20 years ago, and thousands of procedures have been completed to date. There is not much long-term data available on the procedure because it is fairly new in the medical world; however, the majority of patients have reported positive results. Some people require two or more procedures to fully resolve their symptoms.